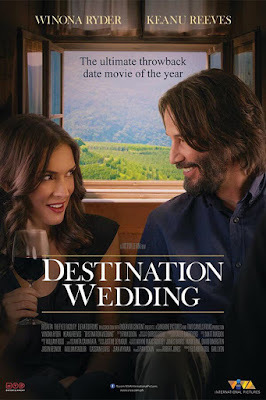 AFTER DOING several films before like the horror flick “Bram Stoker’s Dracula” in 1992, the sci-fi thriller “A Scanner Darkly” in 2006, “Private Lives of Pippa Lee” in 2009 where they played supporting roles, Keanu Reeves and Winona Ryder are now reunited in the unusual romcom “Destination Wedding”. They play Frank and Lindsay, both unpleasant and miserable people who meet each other on their way to a wedding. You’ve seen this kind of story before in other romcoms, where two people who can’t stand each other at the start eventually develop feelings for one another. 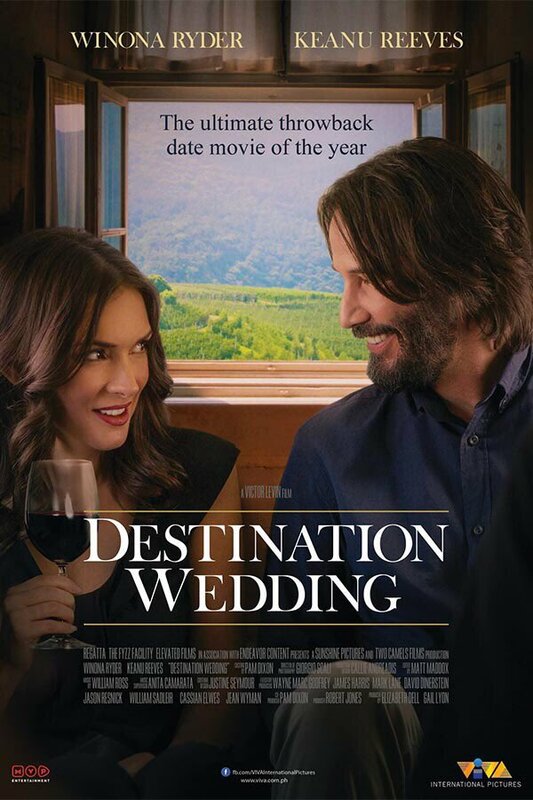 But “Destination Wedding” treats it differently this time since both Keanu and Winona are very negative, pessismistic, narcissistic and far from being likeable. They also don’t believe in falling in love. Writer-director Victor Levin makes them quite repulsive you’d wonder why anyone would want to be involved with them at all, especially with Keanu who’s a misanthrope and doesn’t seem to have any redeeming qualities. He’s the type who wants to scream at the TV set while watching and his only relationship is with a houseplant. Winona, in turn, has been so hurt by her past relationships and is a very acerbic, dysfunctional character. Even their supposed usual meet-cute scene at the airport goes wrong. But they find out that they’re both flying to the same destination wedding in Paso Robles, California. Keanu is the estranged half-brother of the groom who’s attending the wedding out of familial duty while Winona is the groom’s ex-girlfriend who wants to seek formal closure. They become seated next to each other, get adjoining hotel rooms and also get seated together in the rehearsals. It’s apparent that they will be stuck with each other during the weekend. Throughout, they trade mutual insults and exchange their dark views about the futility of leading a meaningfless life. What makes us stick with this two-character film is that the lead actors both have undeniable charm that manages to shine through even if they play annoying, self-absorbed characters. They are shown interacting only with each other, bickering and arguing most of the time and somehow, they are able to make it work wonderfully with so much wit and charm, with the tone kept light most of the time. And it dawns on you that their verbal fights are actually just some sort of amusing foreplay. As the main characters, they throw verbal darts at each right from their first argument at the airport where it’s more of a case of “dislike at first sight”, and all the other people around them barely have speaking lines. The scenes are shot in long takes with the camera remaining standing still. Keanu and Winona have solid chemistry as they exchange rapid fire repartees. Keanu is particularly appealing in delivering his lines with good timing and perfect rythm. Winona reminds you of her young ingenue self before she was caught shoplifting in such endearing films as “Little Women” and “Reality Bites” about two decades ago. It’s really good she’s able to make a successful comeback on TV via “Stranger Things” as the mother of 11. She and Keanu both inhabit their characters effortlessly and work together flawlessy. It quickly becomes obvious that the destination is not the one that’s really significant here but the journey of these two grumpy, disagreeable people together, which they unwittingly share along with the audience. And we, as viewers, are willing to travel with them because, after all, it is not their final destination. Their trip with each other is actually just really starting. As the film goes on, their jabs at each other become a little less sharp and deadly and though they wouldn’t want to consciously acknowledge it, you can feel that somehow, a bond is formed between these two kindred souls. They might be averse to love but, as we all know, love conquers all. Then they take a walk together in this hills and there’s an unexpected encounter with a mountain lion, leading to some unexpected turn of events that make us think, maybe, there’s still a bit of hope for these two cynical people? This is a sort of anti-romcom that is obviously designed for those who like to counter the overly saccharine sweetness of the typical romantic comadies we have. It seems like a twisted version of the “Before Sunrise” series of Ethan Hawke and Julie Delpy. So what starts as a “feel bad movie” soon evolves as a different kind of love story with “feel good” sentiments.